Growing up, onions were an essential in our house; you might even say a staple dish. My Dad can make the meanest onion sandwich you’ve ever tasted, and what’s a piece of steak without a buttery dripping mushroom and onion side! I’ve never lost the love for them, and even find most dishes blah without. So what’s this onion lovin’ lady to do? Make an onion appetizer of course! Don’t be scared off if all you can think is the pungent smell of raw onions, or the bad breath that usually follows after eating onions, because this caramelized onion appetizer won’t even taste like it comes from that family! 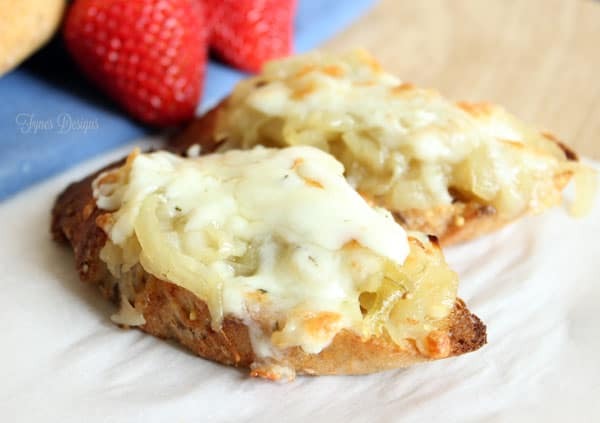 Top this scrumptious treat with new Kraft shredded cheese with a Touch a Philadelphia and this will be an appetizer you won’t forget! Add butter and oil to the frying pan on medium heat until melted. Add onions and sprinkle with salt. Cook, stirring constantly for 15 mins. Reduce heat to low and continue to cook for about 1 hour, stirring occasionally. The onions will reduce to about half of what you started with. 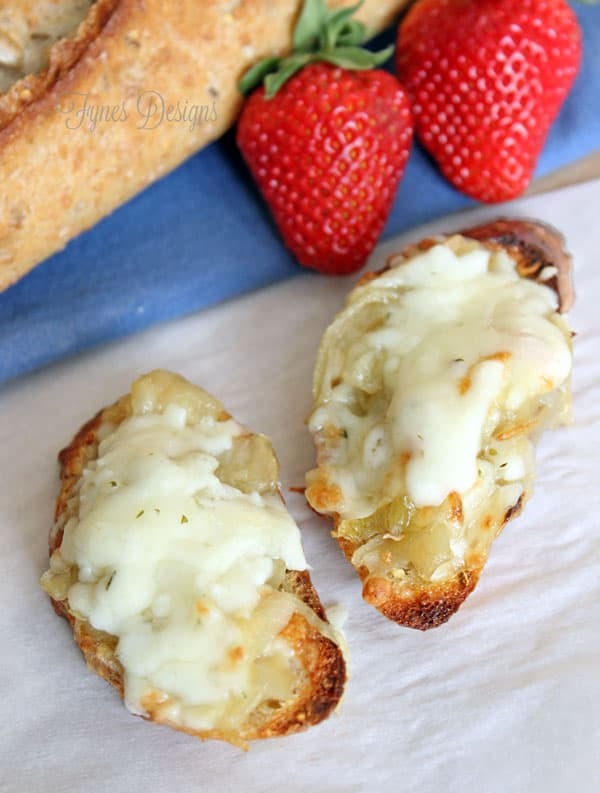 Add a spoonful to each baguette slice and top with Kraft Creamy Herb & Garlic Shredded Cheese with a Touch of Philadelphia. If the onions are already hot; place in the oven under a low broiler for 5 minutes to melt the cheese. If the onions have been refrigerated place in a 350 deg oven for 15 mins, then add the cheese and heat for an additional 5 minutes. This new cheese variety from Kraft is specially blended with Philly to give an even softer creamier shredded cheese. The herb and garlic flavor complements the caramelized onions perfect, and makes this a dish you’ll want to add to every party menu. However, if you’re cooking up another dish it also comes in Creamy Mozza, and Creamy Mexicana too. This cheese is so creamy it makes a melt you’re sure to remember, the one step process to get both cheeses is perfect, and creates such a smooth melt. Kraft Canada is hosting a What’s Cooking Twitter Party on Wednesday, April 16 at 9:00 and you’re invited! Follow #TouchofPhillyCheese @KraftCanada to get the scoop. Visit the Kraft Canada website for more delicious recipe ideas! Yummy! I hadn’t heard about this new cheese. I’ll definitely have to give it a go and this recipe sounds perfect for it! This is beautiful, Virginia! You’re making me hungry; what a great appetizer! What a delicious appetizer! I love the combo of cheese and onions…YUM! I’m soooo going to make these!! Yummy! They’ll be perfect for Gabrielle’s birthday! This looks delicious! I popped over to the Kraft website and it is excellent! Thank you! Now this is how you start a party! Great recipe! This looks so good! 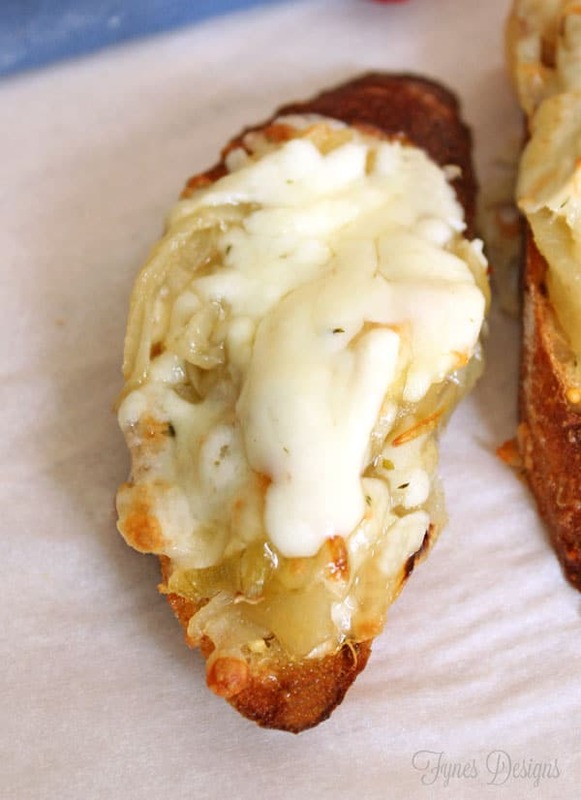 I crave french onion soup all the time and I love that you have turned it into an appetizer. Pinned! This looks absolutely amazing! Thanks so much for sharing your yummy recipe on the Monday Funday Party! This looks awesome! I absolutely love caramelized onions and I cannot wait to give this a try! I would love for you to come share this and some other links over at this weeks Throwback Thursday link party!